The ICCLab here in ZHAW will be co-organising the Open Cloud Day 2013: 11th June 2013 here in Winterthur. /ch/open understands the importance of Cloud Computing, as does the ICCLab. To get the full power of clouds in the view of /ch/open these clouds should be open according of the principles open cloud initiative. The goal is to foster open clouds and interoperability of clouds. Especially taking into account the requirements of public administrations and large as well as small and medium-sized businesses. In this conference concrete solutions and stacks will be discussed. At least one of the afternoon tracks will explicitly be technical. Another key focus area is in the creation of simple to use and open source GovClouds. Concord is a supporting action of the FI PPP programme having as main EC objective the harmonisation, dissemination, facilitation and content of the core platform (FI-WARE), the Cloud Infrastructure (XIFI) and Use Case Projects. From Phase 2 onward , one of the challenge of FI PPP, and therefore of Concord, is the deployment of the Generic Enablers (i.e IoT, QoS, Cloud, Bigdata etc..) of FI-WARE by Use Case Projects above the Cloud Infrastructure of XIFI available by telcos. To support and kick the activities off in Germany most of the agenda of the boards (Architecture, Advisory and Steering) have been drafted together with the plan for dissemination and events. Most of the partners of Concord shall meet at the FIA in Dublin from 8 to 10 May. FI-PPP programme will assume relevance from the phase 3 when most of the projects will be sustainable and in operation involving Small & Medium Enterprises selected by Concord project. At the first meeting of the SIG Cloud Computing Security (SIG CCS) under the new lead of Bernhard Tellenbach, member of the board ISSS, the nine participants of the meeting had a lively discussion about the goals of this SIG. Among the goals discussed were ideas such as writing a white paper on a CCS problem where existing Best Practices, guides or textbooks offer little or no guidance and the publishing of an overview of existing and future cloud certifications. But in the end, the SIG members decided to create a standardized presentation covering relevant aspects of cloud computing security. Since large enterprises typically have the required know-how already in-house and small enterprises usually outsource their IT infrastructure, the SIG decided to gear the presentation toward medium-sized enterprises. When finished, each SIG member is expected to give the presentation at least three times at events organized by trade- and industry associations, SME-organizations, cloud computing interest groups etc. which have members from medium-sized enterprises in their target audience. To avoid reinventing the wheel, the SIG first conducts a thorough review of existing literature and resources on the cloud computing security topic. In a next step, the SIG selects the content to be included in the presentation. Finally, the presentation is built based on both, existing material and new material, to fill the gaps identified during the review phase. In parallel to this work, the SIG contacts groups and organizations which work in the same domain as this SIG. By exchanging information and know-how, the quality of the output is imporved and the SIG can make sure that it does not redo the work of others. 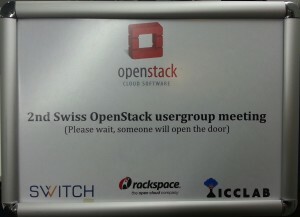 The second swiss OpenStack user group (CHOSUG) was held. It was an excellent event so well attended that there was only standing room! A big thanks goes out to the organisers and sponsors (RackSpace, SWITCH and ICCLab). All talks were recorded by the kind folks at SWITCH and are available for your viewing pleasure! Check out more pics on the CHOSUG flickr account. 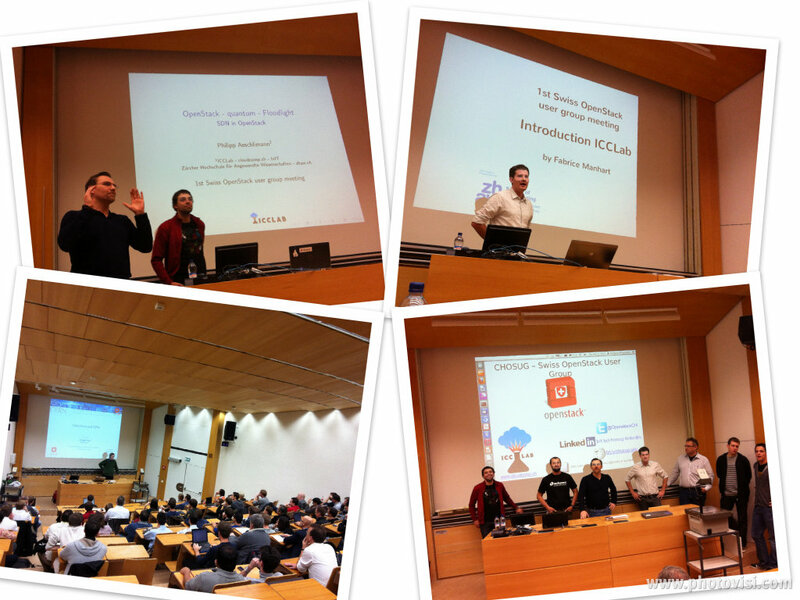 The 1st Swiss OpenStack user group meeting that was organized by the zhgeeks and the ICCLab at the ETH Zürich met with a large response. Over 90 people attended the meeting with different background and interests in connection with OpenStack. The meeting started with a good and brief introduction into the components and the community around OpenStack by Tim Bell and how it is used in CERN, the largest OpenStack cluster in Switzerland. The subsequent lightning talks, each about 10 minutes, covered different aspects in the current usage and development of OpenStack, including two from the ICCLab. We described our OpenStack testbed and also the topical area of software defined networking. The slides and short abstracts about the introduction and lightning talks can be found on the official Swiss Openstack Usergroup Wiki.